Design concepts of the Turkish Aerospace Industries (TAI) HürJet. Turkish Aerospace Industries’ (TAI) General Manager Temel Kotil announced that TAI has commenced work on several new aviation programs: (1) a heavyweight variant of the T129 ATAK with a maximum take-off weight (MTOW) of eight tons; (2) HürJet advanced jet trainer; (3) 10-ton utility helicopter; and a (4) lightweight geosynchronous equatorial orbit (GEO) communication satellite (SATCOM). 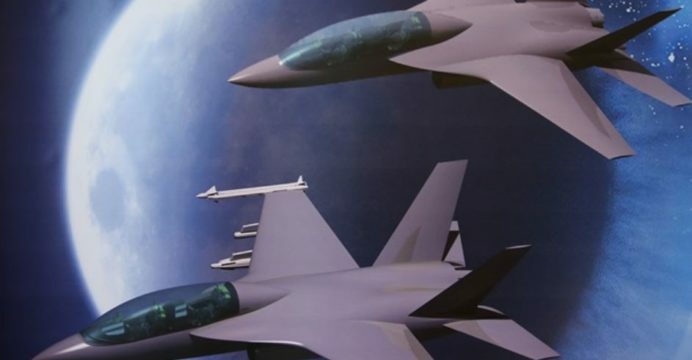 TAI had originally revealed the HürJet advanced jet trainer program in August. On Wednesday September 27, TAI showcased design concepts of the new trainer, which show a twin-engine aircraft with twin vertical stabilizers and armed light-fighter variant. TAI has not yet disclosed specific technical details, such as the projected engine model, avionics suite, payload capacity or range. The 10-ton utility helicopter (Milliyet), which will be analogous to the Lockheed Martin/Sikorsky S-70 Black Hawk, will expand TAI’s transport helicopter portfolio. At the Paris Air Show in June, when TAI unveiled a mock-up of its T625 6-ton utility helicopter, TAI officials had expressed hope of building a complete helicopter portfolio ranging from 3.5-ton to 10-12-ton designs (Flight Global). The 8-ton T129 ATAK would likely be in analogous in size to the Bell Helicopter AH-1Z Viper. The current iteration of the T129 ATAK has a MTOW of six tons. Through the 8-ton ATAK program, TAI will likely aim to imbue the attack helicopter with additional protection and heavier payload capacity. Kotil stated (Star) that the 8-ton ATAK is in the conceptual design phase. Finally, the lightweight GEO satellite, which will weigh one ton, will have 22 transponders. TAI is aiming to market the GEO satellite as a commercial solution. TAI is currently collaborating with other Turkish firms to develop and produce Turkey’s first indigenous satellite, the TÜRKSAT-6A. The qualification tests of the TÜRKSAT-6A will begin in 2018, with the launch planned for 2020. It is likely that TAI’s 10-ton utility and 8-ton attack helicopter programs will require higher-thrust engines over the 1,361 shp LHTEC CTS800, which was selected for the T129 and T625. The S-70i Black Hawk and AH-1Z are powered by the General Electric (GE) T700-series, which has an output of 1,800 shp. However, TUSAŞ Engine Industries (TEI) is a licensed producer of the GE T700, of which TEI manufactures over 50% of the T700’s subassemblies and components (as well as providing engine rebuild and overhaul services). In February, the Turkish Undersecretariat for Defence Industries (SSM) awarded TEI a contract to develop and produce a turboshaft engine for the T625. The first engine is due in 2019, but the development program is projected to require eight years. TEI’s launch platform will be a 1,400 shp design, which will be available to the T625 and T129 ATAK (which also has a MTOW of 6 tons). The TEI program will eventually scale to a 2,000 shp design for larger helicopters. It is not known if TAI will bind the 10-ton utility and 8-ton attack helicopter programs to TEI’s engine program. This may delay the process, and – from TAI’s standpoint – may be unnecessary as TEI can already source the T700. TAI could proceed with prototype and early batch development using the T700, but pivot future variants (especially those positioned for export) with the TEI engine platform.